We are pleased to share with you the CORC Annual Report 2013/14 on behalf of the SA SDI Alliance. This past year we have focussed on our vision of building inclusive cities. As one of the alliance sayings goes, “Nothing for us without us!”. If this is at the heart of what we proclaim, then building inclusive cities is at the heart of what we do. 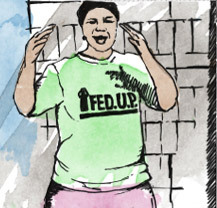 In this report you will find reflections on the progress of key activity areas for the Federation of the Urban Poor (FEDUP) and the Informal Settlement Network (ISN). You will read reflections from ISN & FEDUP national co-ordinators, and the CORC director. 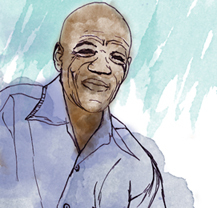 It is in loving memory that we pay tribute to our founding member and mentor, Patrick Magebhula Hunsley, who departed from us too early. 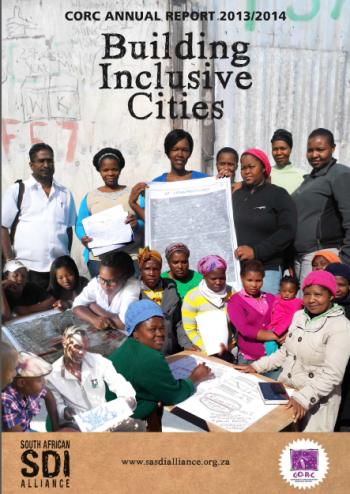 You will receive a picture of the current global and local settings and debates around urban poverty, broader urban development agendas and how SDI and the SA SDI Alliance have responded to these. We update you on our savings, profiling, enumeration, exchange and documentation practices. 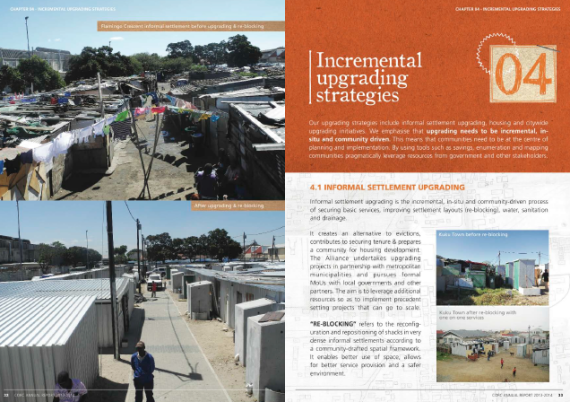 This year we have also included a section on our projects – which we have called “incremental upgrading strategies”. You will receive an overview of informal settlement upgrading projects as well as alliance housing projects. Under this section we also introduce you to our involvement in the Khayalethu Initiative, a city-wide upgrading strategy. We keep you informed about the Alliance’s income generation initiatives, such as the Solid Waste Network. We introduce to FEDUP’s funeral scheme, loan programme and solar light initiatives, that we successfully launched this past year. You will also read about Alliance youth income generating activities through clearing alien plants on the South Peninsula in Cape Town. This annual report contains a detailed outline of FEDUP’s national urban poor fund, the Community Upgrading Finance Facility (CUFF), developments around building a City Fund and our partnerships with organisations like Habitat for Humanity South Africa, Touching the Earth Lightly, Lumkani fire detector, iKhayalami and numerous academic institutions. Finally, we would like to extend our sincere thanks to all our community members, leaders and national facilitators, to our donors, partners, colleagues and friends for your dedications and support of the SA SDI Alliance over the past year.